You remind me of Judith Curry. Sad story really, as she is an actual scientist with actual climate knowledge. Dr. Curry understand every climate change argument and makes note of them in her website, yet once a wee bit of danger rears it's face through the science she devolves into uncertainty arguments for ignoring climate change. Quite sad to see premium minds break down in the face of the dangers presented by climate change. Like a soldier having a panic attack in a foxhole. It wouldn't be so bad if they at least kept their panicky rants to themselves instead of interrupting those who dare to face the dangers. I actually take that as a compliment, as she is one of the great minds in physics, and to think that you would actually compare me to someone as accomplished as her is really quite an honor. Thank you. Yeah she is obviously brilliant. That's why is so sad that her emotions got the better of her in the climate change argument. You seem smart too, unless you are a team of trolls with rehearsed talking points and counterarguments. But in case you are human, you do seem smart, that's why I keep talking to you. I keep having the fools hope that a smart guy like you can disprove what I have shown you. A smart guy like you could potentially have a good explanation as to why the trends will reverse. Or maybe you have a good explanations about why what we are seeing happening in the whole world won't get worse. But no. So far you are as disappointing as Curry, very knowledgeable about everything, but when it is time to reach the logical conclusion that climate change will be really bad, your emotions get the best of you and you go into denial. Sad. First let me be very clear. Your post and my post are talking about two very different things. When will the Arctic be sea ice free in the summer for the first time? What happens after the first ice free Arctic, if anything? remainder of the sea ice cover. system strongly suggests that this reasoning is unrealistic. formation simply falls into the open ocean (Notz, 2009). That causes atmospheric warming, which inhibits growth. That is what has been observed over the last three years of record and near record lows. No speed up in ice formation detected. To the contrary. Again, so far the result of the thin cover is a warmer atmosphere that inhibits ice growth. The story so far is that snow is increasing. The reasons given for ice recovery are not holding up in reality. But it gets worst. The model used in your link predicts an ice free Arctic by 2070. Such a late ice free arctic has been discarded by pretty much everyone. That means the assumptions used by the model are significantly underestimating the warming. That heavily invalidates the model. My guess is that these models are holding the historic winter air temperatures over the Arctic as the likely temperatures when the ice is gone. The observations don't support that at all. What the observations support is significant warming of the Arctic winter when the ice is record low. Warmer air temperatures mean less ice formation. After the ice is gone, it won't come back until the CO2 is gone or milankovitch cycles force it. Thank you for your openness and honesty (and the compliment). I do want to reiterate that I am not saying that the trends will reverse, just that they will slow. Very little in nature can sustain exponential change for long, and the Arctic sea ice is no exception. Many that are claiming the Arctic will be ice-free in a shorter time are just fitting the data to a second-order curve and arriving at a numerical value. That is largely what the Jahn, et. al. paper is saying; namely that estimates of an ice-free Arctic depend largely on the weight given by modelers to different data. What is missing in all these predictions is the physics of the system. Check out the NASA images take at the minimum for each year since 1979. Look closely at where the bulk of the ice has been lost over the decades. The largest decrease in sea ice minimum has already occurred, and further decreases will be much less. This is not necessarily true of the maximum extent. 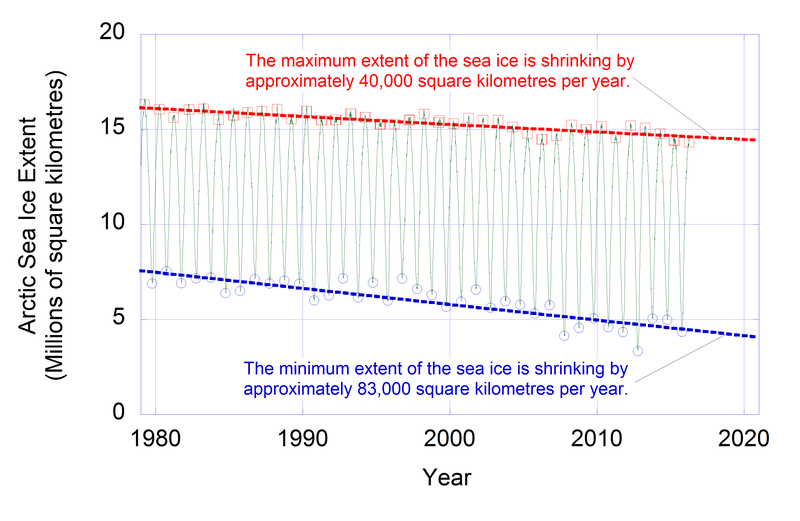 Hence, even linear extrapolations of the sea ice minimum may be too severe as the ice shrinks. Thanks for listening. In recent years, the measured ice minimum is affected largely by these currents, and the strength of the gyres in the Arctic (much research still needs to be done on how these currents may change in the future and affect the sea ice). If greater amounts of warm water is circulated through the Arctic, the ice shrinks substantially, e.g. 2007 and 2012. In other years, larger amounts of ice remains. In 2012 the extraordinary melt happened due to mostly clear skies during spring, with extensive melt ponds preconditioning the ice. A final punch was the August cyclone. Not sure where you got the warm currents explanation. I do want to reiterate that I am not saying that the trends will reverse, just that they will slow. Why would the trends slow? It makes no physical sense. The globe is warming and the Arctic is warming the fastest. That should increase the losses and reduce the gains. There is less ice than ever to absorb the summer warming. The periphery is opening earlier letting in more sun than ever. After the 2007 phase changes the ratio of losses to gains increased, meaning it got worst. If what you say is true it should have gotten better. In real life unchecked asymptotic behavior leads to collapse of the system into a new state. In the specific case of the Arctic what is driving the asymptotic behavior is global warming and all science indicates the global warming will continue AND accelerate. There is no reason to think the asymptotic behavior will simply decrease. Many that are claiming the Arctic will be ice-free in a shorter time are just fitting the data to a second-order curve and arriving at a numerical value. Wrong. A linear fit puts the first ice free Arctic in 20 years. No second order needed. The same fit 20 years ago had the ice lasting until late 21'st century. The trend of the linear trends is decidely down. What is missing in all these predictions is the physics of the system. The physics couldn't get more basic. More warmth = less ice. You are claiming the complete opposite without any physical basis other than your expectation that when there is less ice, the Arctic swill somehow grow more ice or lose less ice. Your claims are the complete opposite of the observations so far. You still do not give a reason why the trends should slowdown. The majority of the ice loss occurs from the Alaskan side, the Beaufort Sea, and the Russian side, from the Barents to the East Siberian Sea. Much less is lost from the ice abutting the Canadian archipelago and Greenland. Extent is not a measure of how much ice there is, how much ice is gained or how much ice is lost. Extent only measures the surface area the ice covers. Volume is the correct measure of ice loss. Using volume, most ice was lost in the thickest part of the Arctic. Hence, recent minima have fluctuated significantly as large swatches of floating sea teeter on the edge of melting and freezing. Yeah, but the result of the fluctuation is a sharp increase in ice loss, as shown in the tables I posted above. The largest decrease in sea ice minimum has already occurred, and further decreases will be much less. Again that's an extraordinary claim, wishful thinking. There is absolutely no reason to believe that we won't have losses like in 2012 and 2016 again. The complete opposite is true. The likelihood of large melt events increases with the global temperatures, the decay of the arctic periphery, and the waviness of the jet streams. Once again your claim remains that conditions won't get worse in the Arctic before that is scary. That's it. Just like Curry emotions got the best of you. appears low solar increases winter temps over the basin....... I though they were becoming warm enough and now we have a winter warm up to face as we move into low solar??? I'd have thought the trend of our record breaking years all being over low solar might point to issues over summer come low solar? We've known since the noughties that over winter low solar leads to a propensity of high northern blocking over the N Atlantic. Does this propensity to HP dominance then slip into the high arctic over summer as the ITCZ heads toward the tropic? If this is true then we can expect a move toward increased melt ponding on the Atlantic side as high pressure leaves clear blue skies for the start of melt season...... the rest is ( recent Arctic) History! We may be talking about two different aspects. I am talking about the minimum, and it appears that you are referencing the maximum. The 2016 Arctic minimum extent (according to NSIDC) was 4.14 million sq. km. Using a linear fit, the sea ice extent will fall below 1 million in 38 years. Based on the current trend, it will be centuries before the maximum would hit that level. The largest decline occurred in 2017. No other year was close, not even the record low in 2012. Obviously we disagree about what is the best measure for the Arctic sea ice. However, if you are going to use volume for your metric, you cannot relate the surface albedo to volume. They are two different measures. The thickness of the ice is largely irrelevant to any surface affects, whether it is albedo or weather changes due to open water. If you have been following the other threads, which I presume you are, you should have read about the increased cloud cover in the Arctic. This has a two-fold effect; increasing winter temperatures by reducing heat loss, and lower summer temperatures by blocking incoming solar radiation. This could explain why the 2017 minimum was only the 8th lowest, and higher than all but three of the past eleven years, while simultaneously increasing the rate of the winter maximum. In 1996, the minimum sea ice extent was 7.191 million sq. km (NSIDC). In 2012, it was 3.387. Physically, it is impossible to lose a similar amount. Once again, no one is saying that more warmth equates to more ice. 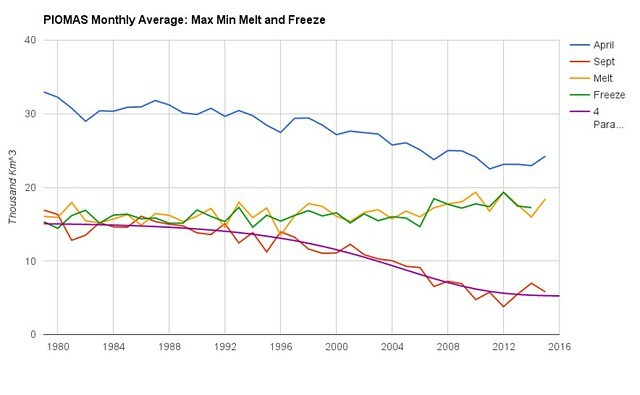 In rather simplistic terms, ice will increase if the average temperature is below freezing and decrease if it is above. The regions that I mentioned previously will remain below freezing for quite some time, and stem the losses from the increasing area that will average above freezing temperatures with the coming temperature rise. Basic physics. The August cyclone in 2012 entered the Arctic from the Siberian side, in the warmer waters. As it moved towards the center of the Arctic, it carried with it some of that warmer water, and the combination of warmer water and intense wave action disintegrated much of the fragile ice. This was an unusual event for summer. It has not been replicated since, and consequently, summer sea ice extent has been higher in recent years. Any trend line that ended in 2012 gave a false impression of higher ice loss. The 2016 Arctic minimum extent (according to NSIDC) was 4.14 million sq. km. Using a linear fit, the sea ice extent will fall below 1 million in 38 years. Nice Chart you've got there. With a thick enough marker you can do anything. But did you ever wonder why, when looking at the minimum (bluish) linear fit, the first decade or so has most of it actual dots below the line, then the middle decades have their dots above the line, and the last decade comes out mostly below the line? That's because the fit doesn't really fit. Arctic sea ice was declining slowly until ~1995, and then started declining more rapidly. Try using a two-line fit and you'll get interesting results. Or if you want, try to calculate what your method would have supplied back in 1990, 2000, 2010, and see if expected the date of falling below 1m km2 keeps moving closer. (Though I have a feeling your chart is taken from somewhere, potentially somewhere with an agenda, and is not self-calculated). Last year there was a big argument about volume vs extent. This is what my arithmetic said. Despite ups and downs, the loss of volume in September has been about 1.8 percent per annum of the 1979 volume. The linear fit has worked amazingly well. The same can be said of September extent, reducing at the lower rate of 1.25% per annum, the linear fit being the best fit. The result is that in September 2017 73% of the volume was gone, but only 50% of the extent. This is not feasible in the long-term. As no-one has come up with verifiable data to show that the arithmetic change in volume and extent has changed, then looking forward one can use the same parameters until proven otherwise. By 2032 the result is absurd. Volume is zero, extent is still 31%. So for me the question is - when will this relationship break down ? Arguing from extent vs volume is arguing about two measures of the same thing. Yes, the fit does not match the data very well. I was using it in response to the previous post to show when the Arctic would reach an ice-free state using a linear fit. I usually use a three-fit line, 1979-1996, 1996-2007, and 2007-present, for the reasons you mentioned. The decline was much less than the average fit over the first two decades, much higher as the sea ice declined more rapidly during that middle decade, and much less during the most recent decade. Indeed, 93% of the decrease occurred during that middle timeframe. Sea ice extent and volume cannot be zero at different times. For extrapolation you need to understand what is happening. Thus I would prefer a climate model with a good sea ice module interpreted by an expert over a statistical extrapolation. The satellite measurements of sea ice are photography in the sense that you get a photo, a map out of it. However, they are not visible images, but microwave radiometry. It can be pretty dark at the poles and it is also hard to distinguish clouds from snow and ice. Microwaves can look through the clouds and water and ice have a very different microwave emissivity. The arguing about volume vs extent metrics has been a persistent feature on this forum as far as I can remember. It doesn't really matter, a summer like 2007 might be all it takes for a new record this September. Another metric is to see how many comments the melting season thread collects in May/June. Here is a better fit. Perhaps looks a bit too horizontal at the end. However I think the acceleration and deceleration is physically explainable in terms of getting rid of old thick ice. If we were talking about albedo, extent would be a good metric, but we are not talking about albedo. We are talking about when the Arctic will be ice free for the first time. For that the best measure is volume for two good reasons. One, extent has no information about ice content, volume does. The second one is that volume hits 0 first. 0 volume = 0 extent. Gerontocrat already illustrated that. If you have been following the other threads, which I presume you are, you should have read about the increased cloud cover in the Arctic. This has a two-fold effect; increasing winter temperatures by reducing heat loss, and lower summer temperatures by blocking incoming solar radiation. This could explain why the 2017 minimum was only the 8th lowest, and higher than all but three of the past eleven years, while simultaneously increasing the rate of the winter maximum. That's extent. 2017 was the 3rd lowest min volume on record, the lowest max volume on record and the lowest annual average volume on record. In 1996, the minimum sea ice extent was 7.191 million sq. km (NSIDC). In 2012, it was 3.387. Physically, it is impossible to lose a similar amount. It is not physically impossible at all. In fact, it is very likely that some time soon that record is smashed. Once again, no one is saying that more warmth equates to more ice. In rather simplistic terms, ice will increase if the average temperature is below freezing and decrease if it is above. Wrong. How much ice is created depends on how many freezing degree days the arctic gets. At -40 tons of ice will form and at -20 much less ice will form. The tendency over the last three year is of much warmer winters that lead to record low ice formation. The regions that I mentioned previously will remain below freezing for quite some time, and stem the losses from the increasing area that will average above freezing temperatures with the coming temperature rise. Basic physics. Sure but what makes you think that it won't happen again? I would think that since such event is new in the record , and it only happened when the Arctic was at record low levels, it seems reasonable to assume that while the Arctic remains at low levels, chances of a GAC happening again are high. That is indeed a better fit. However, if you include 2016 and 2017 the two last data points fall below the line of the minimum, pulling the line further down. If you include 2016 and 2017 the maximum pulls decidedly down. I doubt you can fit the same curve to the Max. That's why I use the maximum to make my argument not the minimum. Even if the minimum stayed at the levels of the past 8 years, the max "predicts" the ice to be gone anywhere from the late 20's to the late 30's. So, at least we agree where we disagree, which is good. I believe that third line is non-existent, and that the use of 2007 as a pivot is blatant cherry-picking, creating a fake hiatus in sea ice minima, same as cherry-picking the 1998 El-Nino for a pivot year created a fake hiatus in the rise of global surface temps. As often happens with such fake lines, when it breaks it usually does so in quite a dramatic fashion. That may be true. Perhaps a third-order fit, similar to the fit in chandler graph would be better. Using 2007 as a pivot is no more a cherrypick that using 1996 as a pivot. If the trend changes it changes. Using a third order fit will smooth it out some, but if it real, it will show. Thomas posted this in another thread. Hayhoe vehemently advises against engaging with the "smokescreens" skeptics tend to offer as the reasons they couldn't possibly agree with or act on the issue of climate change. "There'll be no progress that way," she insists. "It's a lot easier for people to say, 'I have a problem with the science' than it is to talk about what the real problem is." Why would you not be concerned? Worst? It is not like this has never happened before. It will be an adjustment, but not a catastrophe. It has happened before, but not with around 7.5 billion people pointing nuclear weapons at each other. Civilisation is now fragile and vulnerable. The time of human hunter gathering populations having options such as migration or food alternatives is long behind us. It would be a catastrophe. It is a better fit but uses more parameters so you would expect it to be better. Whether it is sufficiently better is a tougher question. >However, if you include 2016 and 2017 the two last data points fall below the line of the minimum, pulling the line further down. Yes of course but so what? If you insist on exponential fit and look back at previous fits to earlier years, that is much worse. >I doubt you can fit the same curve to the Max. Of course I can (see below). It may not look good for the last year but this curve can morph into an exponential curve(over relevant date range), however it finds it better to level out at a surprisingly high level. Note I don't believe the horizontal project, I believe it should still be going down. I agree with you on the importance of the maximum. However the trend extrapolation does not go where you think it goes. Sorry Crandles but that doesn't fit the curve. Sure you can put it there and create an illusion that it does but no data point matches the last inflection. The last inflection is pure fantasy. No exponential fit needed. A linear fit to the max has the ice gone anywhere from the late 20's to the late 30's. Of course that excludes GAC's and min volume/max loss events. That's only the most basic averages devoid of any other information. The trend goes where it goes regardless of where I think it goes. The trend of the trends also go where it goes without the need for speculation. As far as the Minimum volume goes, the apparent hiatus is very likely similar to the hiatus in global temperatures. It will end soon and it will be spectacular. That's what's expected in a warming world. That fit wasn't hand tweaked to get it, it was produced by spreadsheet solver. It isn't pure fantasy, it is standard least squares fit. I am more sure of the physical basis for levelling out of the max than of the minimum. You criticised linear fit for ignoring persistence of anomalies but now when someone shows you where the curve is heading, you are back to preferring a straight line despite the persistence of anomalies. Does this have a faint smell of you having decided on your conclusion and now you are prepared to bend the arguments any way you need to in order to stick to your original conclusion? - It is also true, that Apr volume is relentlessly falling and your fit does not fit. If you tell your solver of choice to fit a nth order line it will do so and it would be fantasy if the lines do not meet the data. In your case the last inflection does not exists in the data, thus that line is pure fantasy. Care to share? I would love to know. Wait what? I've only used linear fits so for all my arguments. I prefer the straight line everytime because there is no human choice in it. Only the simplest math possible. To me that is very powerful if you understand the limitation. Your curve simply doesn't fit. Thanks for proving my point. No point after the inflection chosen by your algorithm fits the line. Does this have a faint smell of you having decided on your conclusion and now you are prepared to bend the arguments any way you need to in order to stick to your original conclusion? Because believing your own eyes would force you to arrive to some very difficult conclusions. Thus you imagine I used exponential curves and you imagine that line fits the max, even when no data point after the inflections falls anywhere near or above the line. Trying to fit data from a chaotic system to a particular curve will never yield an exact match. There are simple too many variables for that to occur. Additionally, putting too much emphasis on a single data point, such should not be a reason to discard the entire curve. Sometimes it is just statistical probability that a particular data point lies further from the norm. The curve that crandles presented is as good as any (probably better), and should lead to trying to understand why the Arctic is doing what the data states. I'm desperately hoping that low solar is not the piece that was missing to keep us from constant drops in extent/area/volume? As I see things we had a run of poor years that saw records for either volume/extent/area smashed and they were over the lower end of the solar cycle. If the 2 perfect melt storms before 07' were 10 years apart then these would also have fallen in the lower end of solar cycles too? I know that there are far more variables in the mix ( ENSO/PDO/QBO etc ) but if we have seen low solar as a way to get high melt/high transport in place then we have an interesting 3 or 4 years in front of us again? My concern is that the ice is no longer capable of surviving another 3 record breaking years of the order we saw last low solar. As ever the losses are not a straight line as the last amount of ice will feel far more melt pressures than other times so as we approach blue ocean I imagine the ice tends to go faster. It might even be there is a volume that we dare not fall below as the ice will then melt out in the volume of open water it exists in? If this year shows any tendency toward sunnier/clearer spells across wide areas I will really begin to worry about the next few melt seasons!!! Trying to fit data from a chaotic system to a particular curve will never yield an exact match. There are simple too many variables for that to occur. If there weren't unknown variables it wouldn't be a chaotic system. It would be a perfectly understood system and perfectly predictable with enough computing power. Additionally, putting too much emphasis on a single data point, such should not be a reason to discard the entire curve. Fun fact, we are talking about 2 maybe 3 datapoints in a 39 datapoint set. All of them go distinctively down. I'm not saying they eventually won't go back up. They very well might. But right now, today, that is not a fit. Funny thing how you are all doing the same thing you accuse others of doing. The curve that crandles presented is as good as any (probably better), and should lead to trying to understand why the Arctic is doing what the data states. The proper use of that line fitted to that data is to illustrate what Crandles think the data will do. That's it. That line is just Crandles opinion of what the data will do in the future stated in graphical form. For that purpose, it is useful so long as you know it is an opinion. It doesn't tell you anything about the data in it's current state because it does not fit. but no data point matches the last inflection. The last inflection is pure fantasy. This tells me there is one inflection point in 2005.91, so all the data from 2006 onwards is saying the steep part is levelling off. (So ignore 2006 and that leaves 11 years of data, yet you seem unable to see it. April gompertz fit has inflection at 2005.09. I would be surprised if there was a perfect match so this seems pretty good agreement between the two. Use enough parameters and you can fit the data and have the extrapolation going wherever you want it to. By selecting this curve type for my fit, I am insisting it goes horizontal at some point, but if it resulted in a better fit this could be year 1,000,000 or later. I don't really believe the data extrapolation should go horizontal, it should still be downwards. However it it useful to see where and what level it levels out at and the answer is soon and high. All models are wrong but some are useful. You have seen it all before on the slow transition thread and on dosbat linked posts. You choose to refuse to see/understand it before so why should I bother repeating it? If you tell your solver of choice to fit a nth order line it will do so and it would be fantasy if the lines do not meet the data. My mathematical statistics lecturer (from Uttar Pradesh) at Uni in 1966 told us that one looks for the best fit (i.e. usually highest R2 value). Mind you we did it by using mechanical difference machines - so linear and x2 (if enough time) on small samples was the best we could do. My opinion (humble or not) is that it is good practice to show the R2 value on the graph (dead easy in excel). One of the problems with least squares is that the higher the order of the polynomial usually the better the fit. A complex equation can follow the ups and down of the data so much better than low order and linear equations. In other words it is simply a matching of data to an equation. Another problem is that R2 gives equal weight to all the observations, when one's hypothesis may wish to give more weight to more recent data. To then use that to predict into the future is really dodgy, and for best practice more than one equation should be used to demonstrate a range of possibilities. I have produced some Armageddon scenario stuff. One I liked showed massive increases in arctic sea ice extent using an x6 equation, and a huge drop in extent using an x5 equation (or was it the other way round?). So most times I don't dare speculate using statistics more than a year or two ahead - and even then with huge caveats. 4 parameters versus 2 parameters is unfair comparison. The improvement is greater for Sept than for April with a ratio of .81 compared to .73. Make of that what you will. Sorry not sure how to properly calculate an R^2 for a curve. I can share the google sheets spreadsheet if anyone wants it. I don't know what google sheets can do or not do. on the menu bar click the FORMAT option in the DESIGN bit. On the right loads of stuff appears. That's where you change the characteristics of your trendline. Go down until you find the options to place the equation and / or the the R2 value on your graph. Let see if I understand the argument of The Slow Transition (one of the best threads on ASIF, everyone should read it). The basis for the argument is the phenomena depicted in this graph posted by Chris Reynolds in the slow transition thread. 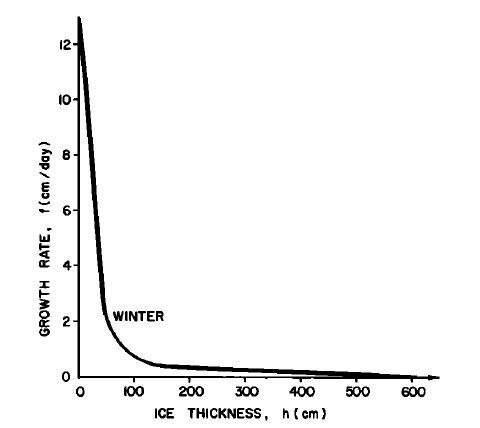 Given the average Arctic winter temperatures, the growth rate of the ice increases exponentially with ice thinness. So obviously the thinner the ice, the faster the ice will grow. In theory the ice losses should reduce significantly as the ice grow thinner because the ice will grow faster. So, yes that phenomenom is real. Did I get that right? If I did my argument is that Arctic winter temperatures are no longer average. Thin ice grows faster but warmer ice grows slower. Who wins? I don't know. But I do know that since the one record high volume gain year in 2013, volume has not recovered in any significant way. The opposite is true. I also know that temperatures are expected to climb. Using an inter-calibrated satellite sea ice product, this article examines the sensitivity of decadal trends of Arctic sea ice extent and statistical projections of the first occurrence of an ice-free Arctic summer. The projection based on the linear trend of the last 20 years of data places the first Arctic ice-free summer year at 2036, 12 years earlier compared to that of the trend over the last 30 years. The results from a sensitivity analysis of six commonly used curve-fitting models show that the projected timings of the first Arctic ice-free summer year tend to be earlier for exponential, Gompertz, quadratic, and linear with lag fittings, and later for linear and log fittings. Projections of the first Arctic ice-free summer year by all six statistical models appear to converge to the 2037 ± 6 timeframe, with a spread of 17 years, and the earliest first ice-free Arctic summer year at 2031. Ice grows faster when it is thinner is certainly part of the slow transition argument, but far from all of it. We should look to the scientific literature to see if there is anything different about the ~1998-~2012 period. There is a big change in the quantity of MYI and an explanation in the literature is the failure of the beaufort gyre acting as a flywheel giving time for the MYI to age and thicken. The MYI ceased surviving the trip around the gyre and the consequence was the quantity, average age and thickness of MYI plummeted. >"I also know that temperatures are expected to climb." Yes and that is going to reduce the thickness of the FYI over time. Do the temperature rises mean this effect dominates other effects such as rapid decline in MYI quantity, age and thickness? That is a tougher question that requires some quantification. In these circumstances you need to know more than just 'the temperatures are expected to climb'. The most persistently probable curve-fit model from all the methods examined appears to be Gompertz, even if it is not the best of the subset for all analyzed periods. One of the weaknesses with just projecting from recent trends is that the natural variability inherent in the climate system could be missed. For example, it's estimated that the Atlantic Multidecadal Oscillation (AMO) and the Pacific Decadal Oscillation (PDO) both influence the transport of heat from the tropics to the Arctic. Recent studies estimate that natural variability is responsible for 30% to 50% of the recent losses in Arctic sea ice are due to natural variability. Some studies are showing that the AMO is shifting from a positive phase, as it has been since the 1990s, to a negative phase. During a positive phase of the AMO, more warm Atlantic water is transported to the Arctic than during a negative phase. This could lead to a slow-down in the loss rates of the Arctic sea ice, which wouldn't be captured by projecting trends. The Arctic and North Atlantic have experienced pronounced changes over the 20th and early 21st centuries, including a rapid loss of Arctic sea ice over the last several decades, prominent multidecadal variability in both ocean temperatures and sea ice, and decadal-scale change in tropical storm activity. We use suites of coupled climate model simulations to probe some of the factors responsible for the observed multidecadal variability in the Atlantic/Arctic system. In our models we show that multidecadal fluctuations of the North Atlantic Oscillation (NAO) induce multidecadal fluctuations of the Atlantic Meridional Overturning Circulation (AMOC). A positive phase of the NAO is associated with strengthened westerly winds over the North Atlantic. These winds extract more heat than normal from the subpolar ocean, thereby increasing upper ocean density, deepwater formation, and the strength of the AMOC and associated poleward ocean heat transport. In model simulations the observed negative phase of the NAO in the 1960s and 1970s led to a weaker than normal AMOC, reduced poleward ocean heat transport, a cold North Atlantic, and an increase in Arctic sea ice extent in both winter and summer. The NAO strengthened from the 1970s to the mid 1990s, leading to an increase of the AMOC and a warming of the North Atlantic. The increased heat transport extended throughout the North Atlantic, into the Barents Sea, and finally into the Arctic, contributing to a rapid reduction of sea ice in the 1990s through the 2000s. Feedbacks involving shortwave radiation are an important component of the overall changes. The NAO-induced AMOC increase also led to hemispheric-scale atmospheric circulation changes and increased Atlantic hurricane activity, as well as atmospheric teleconnections to the Southern Ocean. Since the mid 1990s the strong positive phase of the NAO has weakened to a more neutral phase. Climate projections for the next decade that take into account recent behavior of the NAO as well as anthropogenic radiative forcing suggest a weakening of the AMOC and associated ocean heat transport, which would tend to moderate the rate of Arctic sea ice loss over the next decade. This effect is superimposed on the persistent and growing effects of anthropogenic climate change. Satellite observations reveal a substantial decline in September Arctic sea ice extent since 1979, which has played a leading role in the observed recent Arctic surface warming and has often been attributed, in large part, to the increase in greenhouse gases. However, the most rapid decline occurred during the recent global warming hiatus period. Previous studies are often focused on a single mechanism for changes and variations of summer Arctic sea ice extent, and many are based on short observational records. The key players for summer Arctic sea ice extent variability at multidecadal/centennial time scales and their contributions to the observed summer Arctic sea ice decline are not well understood. Here a multiple regression model is developed for the first time, to the author’s knowledge, to provide a framework to quantify the contributions of three key predictors (Atlantic/Pacific heat transport into the Arctic, and Arctic Dipole) to the internal low-frequency variability of Summer Arctic sea ice extent, using a 3,600-y-long control climate model simulation. The results suggest that changes in these key predictors could have contributed substantially to the observed summer Arctic sea ice decline. If the ocean heat transport into the Arctic were to weaken in the near future due to internal variability, there might be a hiatus in the decline of September Arctic sea ice. The modeling results also suggest that at multidecadal/centennial time scales, variations in the atmosphere heat transport across the Arctic Circle are forced by anticorrelated variations in the Atlantic heat transport into the Arctic. None of this is to deny the impact of greenhouse gas emissions and the warming climate. If we don't reduce are emissions and lower the concentrations in the atmosphere, the Arctic will eventually become ice free. It's just a question of how soon. Projections of the first Arctic ice-free summer year by all six statistical models appear to converge to the 2037 ± 6 timeframe, with a spread of 17 years, and the earliest first ice-free Arctic summer year at 2031. I can certainly agree that 2037 is a very good fit for the data. That's an earlier date than what I got in the calculations above using volume maximum and average losses. Sadly, such prediction is vulnerable to things like GAC's, strong el niños, changes in atmospheric and ocean circulations and unknowns of large magnitude. Once 0 ice is hit the trends won't matter because it will be a different system. But that is a different argument all together. Now all we need is a coupled model that predicts the Arctic gone by 2037. If such model predicts that the ice will recover after the first ice free Arctic I would be surprised but very happy because chances are I'm wrong about an irreversible state change. New research by Till Wagner and Ian Eisenman, scientists at Scripps Institution of Oceanography, UC San Diego, resolves a long-running debate over irreversible Arctic sea ice loss. Ever since the striking record minimum Arctic sea ice extent in 2007, the ominous scenario of a sea ice tipping point has been a fixture in the public debate surrounding man-made climate change and a contingency for which Arctic-bordering countries have prepared. For decades, scientists have been concerned about such a point of no return, beyond which sea ice loss is irreversible. This concern was supported by mathematical models of the key physical processes (known as process models) that were believed to drive sea ice changes. The process models forecasted that increased global warming would push the Arctic into an unstoppable cascade of melting that ceases only when the ocean becomes ice-free. They created a model that bridged the gap between the process models and the GCMs, and they used it to determine what caused sea ice tipping points to occur in some models but not in others. My take after the discussion? Natural variability has been dead a long time ago. Others disagreed with excellent reasons. I agree that might help a bit. It doesn't appear it was much help during the 80's but still, lower sst's are lower sst's. Sadly, low sst after the last few decades of warming may look like a high sst of the beginning of the 20th century. We'll see in about a decade it seems. If the ocean heat transport into the Arctic were to weaken in the near future due to internal variability, there might be a hiatus in the decline of September Arctic sea ice. We are betting our world on "if's". Bad bad bets. If the AMO is a major player, then the ice would be expected to be higher in the 1980s, as the AMO was negative. The AMO turned positive in 1996, around the same time that the ice started it’s precipitous decline. Base on the graph, the AMO appears to have peaked in the mid 2000s, and been flat since. There is a correlation, maybe there is causation also. Of course, that's why I'm here. Regrettably, your link doesn't say what I want to hear. From a quick read the gist of that article is that if we lower CO2, thus cooling the planet, the ice will return. I can certainly agree with that as the ice has been gone before and returned. But that is not my concern at all. I'm 100% sure the Arctic ice will return when milankovitch cycles say so or CO2 is reduced. My concern is that there is no reason to think that CO2 levels will be reduced or global warming stopped. None. So if the warming is not reduced there is no reason to think that summer ice and most of the winter ice will return after the first ice free arctic. The fact that the model you linked assumes an "aquaplanet" cements it for me that that model is not an accurate representation of the climate system anyway. Just a useful idealization, so it says nothing about the impact of an ice free arctic in the real world. The AMO was a major player, but global warming might have already overwhelmed the signal of the AMO. Today's negative AMO is yesterdays positive AMO. Today's positive AMO is super positive in terms of actual SST's, not the anomalies. Anthropogenic aerosols in the Arctic have their strongest impact in Spring. Reductions of sulphate aerosol emissions between 1980-2010 are responsible for 1/4 of the total warming there. Warming in the early spring melt season is the strongest factor determining end of season minimum sea ice levels. Anthropogenic sulfate in our study yields more strongly negative forcings over the Arctic troposphere in spring (-1.17 ± 0.10 W m^2 ) than previously reported. From 1980 to 2010, TOA negative RF by Arctic aerosol declined, from -0.67 ± 0.06 W m^2 to -0.19 ± 0.05 W m^2, yielding a net TOA RF of +0.48 ± 0.06 W m^2. The net positive RF is due almost entirely to decreases in anthropogenic sulfate loading over the Arctic. We estimate that 1980–2010 trends in aerosol-radiation interactions over the Arctic and Northern Hemisphere midlatitudes have contributed a net warming at the Arctic surface of +0.27 ± 0.04 K, roughly one quarter of the observed warming. However, the total warming in the Arctic associated with a complete reduction of Sulphate Aerosol emissions derived from the models that most accurately include this factor indicate that a complete reduction in Sulphate Aerosols will increase Arctic temperatures between 2C and 4C on an annual average. Therefore, the Arctic is currently being bolstered significantly from air pollution, the last 30-years of reductions in air pollution emissions have been responsible for much of the sea ice loss during the satellite era and the exact date of ice-free Arctic is strictly dependent on what we do going forward WRT to these aerosols. This is an observed function of direct Arctic geoengineering that we are doing today. I attach two graphs. The data is the same and is direct from the NSIDC spreadsheets. One shows winter sea ice dropping like a stone, the other gently going down. The polynomial trend line on the Armageddon graph has a better R2 value than the linear trendline. For me the graphs do show one thing - and only one thing - the range of possibilities in the years ahead. To use them as any proof of anything is just not on.. The horizontal trend is a result of the gompertz curve selected. I have said it repeatedly that I don't believe that, it will continue downwards. The useful part I was referring to was as a test of whether the steep part of the curve had started to level out. This is about the past not the future. Even then just the curve is not enough. Had there only be 3 or 4 data points past the inflection then it would be appropriate to conclude the curve was overfitting taking advantage of random variations in the last 3 or 4 years. With 5 or 6 years past the inflection, that should still be considered a possibility, but with 11 years past the inflection (think 11 heads from 11 coin tosses), the possibility seems remote. This of course doesn't mean the trend can't accelerate again. We're trying to project a description of a complex phenomenon well beyond our data, and should be cautious in whatever we predict. I remember in 2012 I was worried we might well be dropping off a cliff with a sharp acceleration in ice loss, but luckily that hasn't actually happened, or at least not to anything like the extent I feared. Yet. The linear trend is going down. The same is true for the trend of the linear trends. What can possibly slow down/reverse the trends? If climate change were to bring more low clouds to the Arctic, ice thickness should increase due to the increased energy loss from the Arctic climate system. However, the added atmospheric cooling by low clouds would probably increase the poleward energy flux from the midlatitudes, reducing the increase in ice thickness. An increase in high clouds would decrease Arctic ice thickness by reducing the loss of energy by the surface-atmosphere system. The enhanced atmospheric warming of high clouds probably would decrease the poleward energy flux and slightly offset the reduction in ice thickness. The general understanding of the role of clouds in the Arctic climate will be greatly improved by reliable observational estimates of cloud radiative forcing as a function of cloud type and season. 2. Snow cover. If the WACCy pattern becomes the norm, then it is reasonable to assume a negative feedback due to albedo changes. So far, snow has significantly increase in thickness but extent has dropped significantly in spring, increased significantly in fall and increased slightly in winter. The effect of the increased snow hasn't slowed down the trends. Maybe at some point it will. 3. Natural Cycles. The big three natural temperature cycles that I know about are the AMO, the PDO and ENSO. In 2016 all three of those cycles were positive, which got us the hottest year on record. The last 2 ENSO was negative. Temperatures remain high. The trends kept marching down. The following graph shows the PDO, the AMO and global temperatures. ENSO not available in the site, but it doesn't matter. It seems that during a -AMO and -PDO cycle the most we can hope for is a hiatus in global temps. That might or might not translate to a hiatus in Arctic temperatures. The trend can indeed slow down for a few years or even decades. Sadly GHG's ensure the temperatures won't cool enough to reverse the trend. 4. Solar cycles. Yeah I know this is a extremely small forcing, but it is so constant in its periodicity and so global and so steady for so long that I can't convince myself that it doesn't matter. It might not matter for global temperatures as the data clearly shows that solar has been in the decline for 5 decades and temperatures really don't seem to care, but it must matter for something. So what am I missing that the GCM's see to reverse the trends? We're trying to project a description of a complex phenomenon well beyond our data, and should be cautious in whatever we predict. 2. Prepare humanity for it. I wish I was exaggerating and being alarmist but all the evidence I find tells me I'm not. An ice free Arctic is the biggest threat humanity has ever faced.